There’s no need to add blogspot at the url, just type your desired url, submit and presto! You can see whether it’s already taken (X) or still available (B). 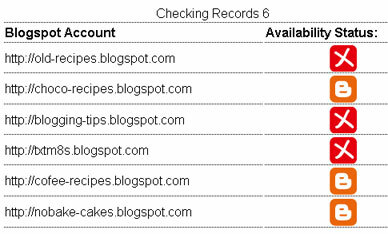 This Blogspot checker can check a maximum of 10 Blogspot URLs. If your desired URL is already taken just like my queries above, you still have an alternative. Alter the URL a little bit by adding some hyphen, or by adding an extra word to an already taken Blogspot URL. Are you seriously thinking to start a recipes blog amor? You’re welcome Glenn. Burger, Burger! Great! Galing naman ng name checker na yan!